Where has the time gone! Christmas will be here before you know it! This month the eCraft Design Team is being sponsored by Peachy Keen Stamps and Scrapbook Adhesives by 3L; our challenge for the week is to create something Christmas Themed with the images we received from Peachy Keen Stamps. The images I received were the Teddy Bear and Reindeer Face Parts. 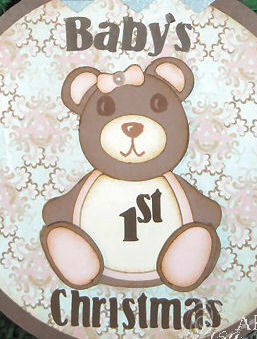 I thought these images would look cute paired up with the Li'l Bear Card Template from Creations by AR, to create a Baby's 1st Christmas Ornament. All images were cut from card stock/pattern paper using the eCraft. I did have to shrink down the Li'l Bear Template to about 2" x 1-1/2" (assembled size) to work with the Teddy Bear Face images. I used the Ornament Basics Template (original size) cut from Chocolate for my Ornament, then shrunk the pattern and cut the Ornament from Basic Grey pattern paper. The Ornament Topper is from the Ornament Box Set (Large Template - original size) cut from Silver card stock and embossed with the Distressed Stripes Embossing Folder. I found it best to cut the words from vinyl, with them being so small (1/4" tall) it was much easier to adhere them to my project since they were already sticky. Click here for downloadable directions and a supply list. One winner from each of the 5 blogs will receive a Zva prize package worth $30.00. Congrats to the winners! Beautiful! Lovely Sentiment and the design is gorgeous. Please email me with your shipping information to claim your Zva Prize package! Just beautiful! Amazing what you can do with such a small canvas! So adorable! Love the cute design! So cute! Perfect for a baby's first Christmas! very cute, this would definitely make an adorable first Christmas ornament! Hey, Lisa! I love how you incorporated the baby bear with the ornament templates. Wow, 3-in-1. Your mind is always working overtime! Thanks for being such an inspiration!